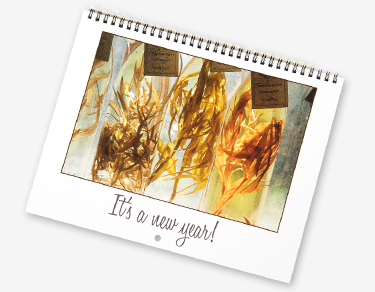 Cards and Calendars for all occasions! or upload your own custom designs. 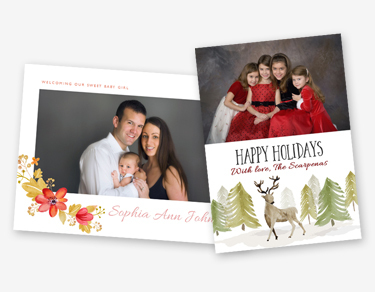 Lenzart gives you the opportunity to offer your client personalized cards, an item that exudes class and style. Professionally finished press printed cards are available on a variety of stocks and can come in double-sided flat cards or folded cards, in sizes 4×5, 4×9.25, 5×5 and 5×7. Enjoy four card stock options: 80# Standard Matte, 110# Smooth Satin, 130# Linen, and 120# Extra Heavy Matte. The folded cards are creased and shipped flat. All include envelopes at no additional charge. Practical and timeless, Single Page Poster Calendars are an exquisite way for clients to display favorite images from their latest session. They are printed on 80 lb. cover stock and you’ll have your choice of black or white type. 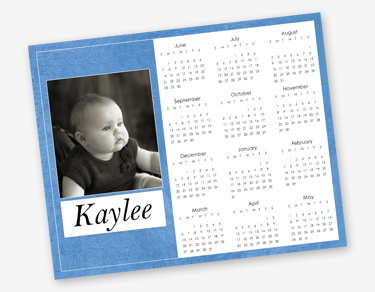 Photo Paper Calendars are printed on photographic paper with the option to mount on bevel board for a clean, quality look without the need for framing. You’ll have a variety of designs to choose from and when you activate the design tools, you’ll be able to add text, your studio logo, or anything you want!